Let our skilled technicians custom design a new instrument panel to best fit your aircraft and avionics needs. Panels are designed using AutoCAD to your exact specifications, then laser-cut, painted, and silk-screened. Prepare to be amazed at what a new panel will do for your cockpit! 24-Month Altimeter, Static, Encoder, and Transponder Certifications: Stay current on your required certifications per FAR 91.413 and FAR 91.411. What does this mean? You cannot fly IFR unless your Altimeter(s), Encoder(s), and Static System(s) have been tested within the past 24 months AND you must have your Transponder(s) checked every 24 months or following any type of maintenance that would affect the accuracy of your Altimeter or Transponder. The certification is good through the end of the month in which it is due. Skycom Avionics has in-house repair capability on a vast array of avionics equipment. Looking at purchasing a used aircraft? Have Skycom Avionics complete a Pre-Purchase Inspection on the exiting avionics before you buy and avoid expensive “surprises” later. No AOG or downtime. 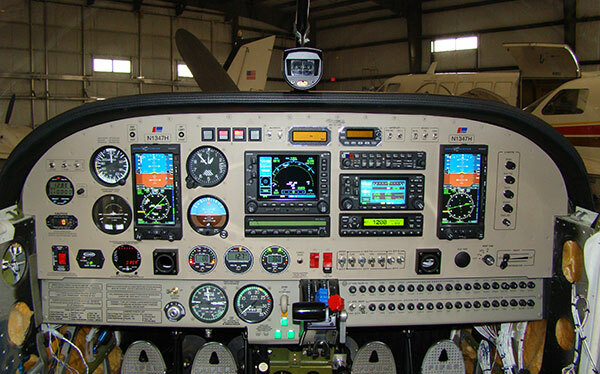 Skycom Avionics has an extensive inventory of loaner equipment available to keep you flying!